When it comes to AI technologies such as machine learning, Google’s aspirations are too big for it to accomplish them all itself. At last year’s Google I/O keynote, CEO Sundar Pichai laid out the company’s vision for a new era of AI-first computing. AI mattered at least as much at this year’s keynote on Wednesday. But instead of being a vision, it was more of a fact of life. That’s because it was everywhere–in Android, Google Photos, the Google Home speaker, the Google Assistant (which will add a machine-vision feature called Google Lens), and more. After the keynote, I caught up with Google senior VP of engineering John Giannandrea–who, though he didn’t appear onstage, is deeply involved in all of the above efforts and others as the company’s lead for AI. “Last year, we talked about becoming an AI-first company and people weren’t entirely sure what we meant,” he told me. With this year’s announcements, it’s not only understandable but tangible. At I/O, Google announced Google.ai–which is maybe less of an actual thing than a statement (and accompanying website) designed to remind the world of the company’s ambitious and far-flung efforts in AI. Giannandrea calls it “an umbrella brand” that shows off Google’s work in hopes of inspiring others to build upon it. “We’re saying, ‘Come use this amazing stuff, see what you can do,” he explains. It’s not just about Google’s own apps, services, and gadgets. The AI techniques created by Giannandrea’s team may make their way into Google products such as Lens; be turned into on-demand Google Cloud offerings that can power other companies’ software and services; be leveraged in research efforts such as the company’s work to identify breast-cancer tumors; and be open-sourced so that anyone can use and tweak them for purposes beyond Google’s own ambitions. “We see our job as evangelizing this new shift in computing,” Giannandrea says. Giannandrea says that Lens isn’t the result of any particular breakthrough, but rather slow and steady process in machine vision–and, particularly, the fact that the technology is getting better at avoiding false-positive and false-negative identifications. “Computers have just been getting better at seeing,” he says. 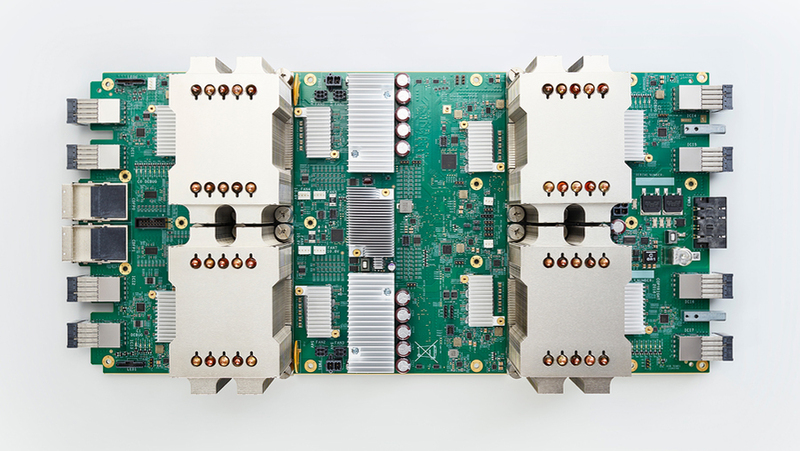 If you think of Google performing AI, you’re likely to envision a data center full of servers crunching numbers in the cloud. On that front, the I/O keynote included the announcement of a second-generation version of the ultra-powerful machine learning-optimized hardware it calls a Cloud TPU. (“It’s exciting to have 180 teraflops of hardware devoted to learning,” Giannandrea cheerfully says.) But Google is also at work on AI-infused technologies that run directly on mobile devices, an approach that has gotten more effective as it’s learned how to perform AI more efficiently and gadgets have gotten more powerful GPUs, the chips that are suited to the high-speed calculations required by AI. TensorFlow Lite, a new offshoot of Google’s open-source TensorFlow software for creating machine-learning applications, runs directly on Android devices, enabling features such as new features in Android O that are smart enough, for instance, to notice that the text you’re trying to highlight is an address. It wouldn’t work nearly as smoothly if it had to talk to a server across an internet connection. Google Home recently gained the ability to distinguish between up to six different people’s voices–a key upgrade because it unlocks the potential for the Google Assistant service to know who’s talking and respond with more customized information, such as details about travel plans drawn from a specific person’s Gmail, for instance. I knew that telling voices apart was an impressive feat because my colleague Jared Newman wrote an entire story in March about how hard it was. Google has worked its AI into so many aspects of so many of its ventures over the past year that I asked Giannandrea whether he thought it could keep up the pace in the years to come. “I actually think we’re speeding up the rate of acceleration,” he told me. “But it’s obvious there are problems we don’t have solutions for.” For instance, as uncannily effective as Google search can be, and despite the power of its knowledge graph, computers don’t truly understand what humans write. Google would like to teach them to “read anything and summarize anything,” Giannandrea says. Another big challenge is to create machine-learning technologies that can understand facts about the world with less training. Giannandrea notes that his 4-year-old daughter saw an old-school penny-farthing bicycle, knew it was a bike, and–once he’d told her about it–was set to identify penny-farthings from then on. Today’s computers would need a lot more data to learn the same thing.